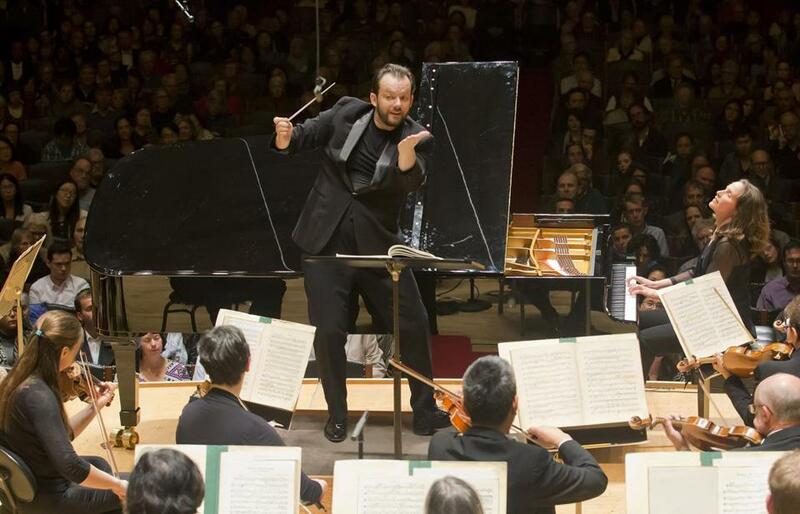 Hélène Grimaud (right) joined Andris Nelsons and the Boston Symphony Orchestra Tuesday night at Symphony Hall. To walk around during intermission at Symphony Hall on Tuesday night was to navigate a thicket of muted panic, smartphones casting a bluish pallor on patrons’ faces as they huddled in twos and threes in the halls or sat in their seats scrolling. Many performing arts organizations in New York City had opted to go dark on election night, citing low ticket sales in the past. The Boston Symphony Orchestra launched a two-week Brahms marathon, which will feature both Brahms piano concertos with Hélène Grimaud and all four Brahms symphonies, complemented by two world premieres. The hall looked about two-thirds full from a vantage point on the left balcony. People were reliably coming to escape the election mayhem with music. Maybe it wasn’t a complete escape. On the floor below, many were visibly checking the poll returns down to the wire before Andris Nelsons raised his baton, and a few even kept doing so during the concert. However, spirits were calm for the most part, as the first half kicked off with the cinematic fanfare that began the world premiere of Eric Nathan’s “the space of a door.” Nathan’s music is often inspired by place, and this work was inspired by the Providence Athenaeum library as much as it was by Brahms’s Symphony No. 2, with which he requested it be programmed. (It will be on Friday and Saturday.) The short piece shimmered in sweeping gestures. The interplay of whistling woodwinds added a dash of whimsy but not campiness, and a sense of awe twinkled throughout. It struck a balance between more introspective thinner textures and delightful sensory overload. Hélène Grimaud’s element is water. Performing Brahms’s titanic Piano Concerto No. 1 from memory, everything about her flowed: her eddying trills, her elegant phrases, her relaxed countenance. Her first entrance was powerful in its understatedness, bubbling up from under the orchestra. She made liberal use of the sustain pedal, slightly muddying the lines in the lower registers but adding a gentle sparkle everywhere else. The orchestra supported her with a heartening, warm tone. The lyrical, slower second movement featured languorous, sparse passages that turned into a quick current of notes, and her third-movement solo passages raged and cascaded. The crowd roared, rising to its feet, and for a short time, the only screens visible were those taking post-performance pictures of the radiant soloist. But then came that vertiginous intermission, and a cold buzz of conversation filled the air. When Nelsons took the podium to lead Brahms’s Symphony No. 1, he lingered there in silence for a minute, checking in with his musicians and turning over his shoulder to gaze at the audience for a moment. Doubtlessly, the scene backstage had resembled that in the house, and he sensed the shift. Brahms took decades to complete that first symphony, haunted by the legacy of Beethoven. The tempestuous minor-key first movement was realized with rare immediacy, fragility, and clarity, the vast unison themes calling out from all around, the invisible barrier between performers and public seeming to dissolve. Concertmaster Malcolm Lowe contributed a poignant solo to the end of the lighter second movement, and the third had a dramatic and tenuous atmosphere despite its major-key optimism, just a quick respite in the struggle. The piece’s emotional apex lies in the fourth movement, after a few minutes of slowly swirling minor chords and tense plucked strings. Marking the passage from darkness to light, James Sommerville’s horn solo serenely pierced the clouds. In unison strings, a hopeful theme glowed like a candle in a window, simple and determined, for a few brief measures. It split high and low, surrounding itself with winds and percussion, evolving into a blazing torch. Nelsons dug his hands in and the orchestra responded, almost frenzied in its triumph. It sang of Brahms’s victory over the ghosts of his past, and ours, just for the space of a few breaths, over the uncertainty that encroached on us. In that moment, it mattered not what kind of world awaited us outside the space we chose to share that night, for it was clear that as long as we are together — in joy or grief, ease or hardship — there are some lights that will never go out.